Go behind the scenes of Rovio's newest game and submit questions to the team. Unless something goes terribly wrong, Angry Birds Star Wars will be one of the year's most popular smartphone and tablet games. 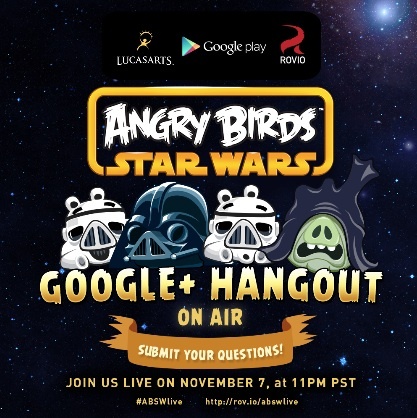 Fully aware of this, Rovio and Lucasfilm plan to host a live Google+ hangout tonight, November 7, at 11PM Pacific, 2PM Eastern; for what it's worth, we expect the game to appear on the U.S. App Store by 11:00PM ET. The point of all this is to give fans a sneak peak at the game, as Rovio takes them behind the scenes of the brand-new cinematic trailer. Not only that, but they can submit questions (even video questions) directly to the team. On that note, go here to attend this evening's Google Play hangout, and submit questions by clicking this link. Enjoy.